Lee Laser (now part of Coherent) built a successful business featuring lamp-pumped and then diode-pumped (i.e., DPSS) solid state lasers, with powers up to 100 watts. In a field with multiple low-cost competitors, Lee Laser was able to effectively differentiate their brand as a supplier of affordable industrial lasers featuring “workhorse” reliability. Prior to the company’s acquisition by Coherent, Lee saw this brand image threatened when some of their side-pumped DPSS lasers failed to work to specification when received by the customer. Because of the importance of reliability to their industrial customers and to Lee’s market leadership, the company set out to identify and eradicate the source(s) of these failures. 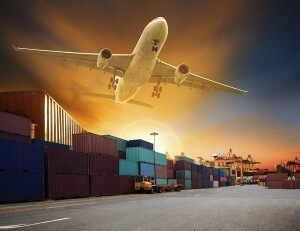 By a process of careful analysis and elimination, engineers at Lee Laser identified erratic thermal cycling during shipment as the likely culprit. For instance, a laser might spend hours in freezing temperatures in the hold of a cargo plane or in a truck on a winter’s day. Additionally, the crate might be left in blazing sun on the tarmac at some intermediate point in its journey. And, this probable thermal cause was entirely consistent with the misalignment problem occurring mainly before reaching the customer, rather than during long-term use. This is because most industrial processes occur under fairly constant thermal conditions in order to maximize process consistency. But how was thermal cycling compromising laser performance? Mismatched thermal expansion is a culprit well-known to engineers, not just in our industry. If an assembly contains components fabricated from two or more materials having different coefficients of thermal expansion (CTE), then repeated temperature cycling can cause small physical shifts, some of which become permanent. The symptoms of degraded mode quality and reduced power indicated that the cavity optics were shifting out of alignment during shipping. Depending on the specific model, there are up to five two-axis adjustable and lockable mounts used to hold cavity mirrors and other optics in the laser head. These were of the flexure type, chosen to provide high mechanical stability without major cost, produced by a leading photonics components supplier. However, these traditional two axis flexure mounts consist of three separate plates attached to two individual leaf springs using screws or spot welding. And it turns out that the use of dissimilar metals in these mounts meant that they were not immune to the effects of thermal cycling. An example of a next generation monolithic flexure mount, with integrated leaf springs, all machined from a single block of metal. This example from the Siskiyou IXF series is intended for beamsplitter applications, with cutouts to accommodate large beam diameters. 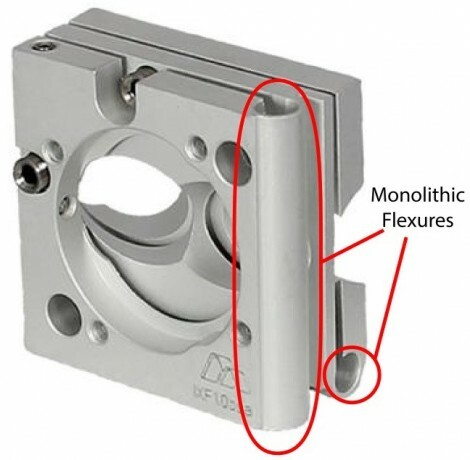 To address this issue, Lee Laser evaluated a next generation flexure mount type – the IXF from Siskiyou Corporation. These are single and double axis flexures in which the entire part is machined from a single block of steel or aluminum. Consequently, the entire mount expands or contracts uniformly with temperature changes. Moreover, this monolithic construction also translates into improved heat transfer through the entire mount. Together, this makes their locked alignment relatively insensitive to ambient temperature changes. Plus, these mounts are available with a low profile top adjust option simplifying their use in the confines of a compact solid state laser head. Lee Laser switched to using these monolithic flexures, initially on a trial basis. Returns due to performance issues dropped to virtually zero, confirming that the original mounts were the culprit, and that the Siskiyou mount eliminated the problem. These mounts are now utilized in several models of their DPSS lasers where flexure adjustment capability is needed.